Wunderlich: If I was going to sum up Rai nice and quickly, I’d call it a Japan-centered Blade Runner with major Akiraand Elephantmen vibes. It’s a cool book with huge potential that’s written well, with simple yet effective dialogue and a plot that’s interesting from panel 1. Your enjoyment of this book, however, will depend on two factors. First, you must enjoy the art of Clayton Crain. Personally, I’m torn. Some panels draw attention to his overly digital painted style with muddy faces, unnecessarily blurred backgrounds and sporadically rushed looking character work. Other panels are gorgeous, with deep details and rich textures, perfectly accentuating the mood of the page. It’s a hit and miss effort that leaves me wondering what future issues will look like. If rushed, this book’s look could go downhill quickly. The second factor is a very important story element. I can usually suspend my disbelief for the sake of plot, but here we’re asked to believe that this floating, futuristic Japan has been murder-free for a thousand years. The very lifelike androids that act as companions (they’re called PTs here) get bullied, killed and whatnot but humans do not murder each other. We’re showed that civilians carry guns, get into fights and there’s a population of terrorists opposing the faceless ruler “Father”, but we’re supposed to believe (and I’m repeating this to stress how unbelievable it sounds) that no murder has occurred in a thousand years. I just couldn’t buy it. Those two issues aside, the world Kindt and Crain build is an impressive one. It’s a familiar, rainy, futuristic cityscape that teems with great sci-fi designs—nothing all that new, but striking nonetheless. Rai is the city’s fabled protector, working under Father for the people. He’s rarely seen, so when he makes an appearance you know something big has happened. Enriching the book is the story of Spylocke, a fictional James Bond by way of Judge Dredd type character that may or may not be real. He’s a neat addition that reminds us Kindt has more than just a few good ideas in store. If you’re fortunate enough to get your hands on the “plus” edition of this book, you’ll be treated to an insert that adds wonders to the experience. Included is a large map of future, floating Japan drawn by Kindt that reminds me of Brandon Graham’s Prophet. It’s huge and awesome and makes you crave more of Kindt’s unique art style. There’s a small, rather inconsequential Spylocke story by Sean Ryan and Vincent Cinfuentes that doesn’t do much, followed by a fake Spylocke movie review by Ryan (with designs by Rian Hughes) that looks neat but is easy to skip. It’s the last bit that steals the show, though. Kindt writes a movie/commercial depicting Earth, far below floating Japan. It’s a propaganda piece with insanely awesome art by Raul Allen and a (literally) lemon-headed protagonist that I hope we see more of. I see future issues of Rai going in any of three ways. 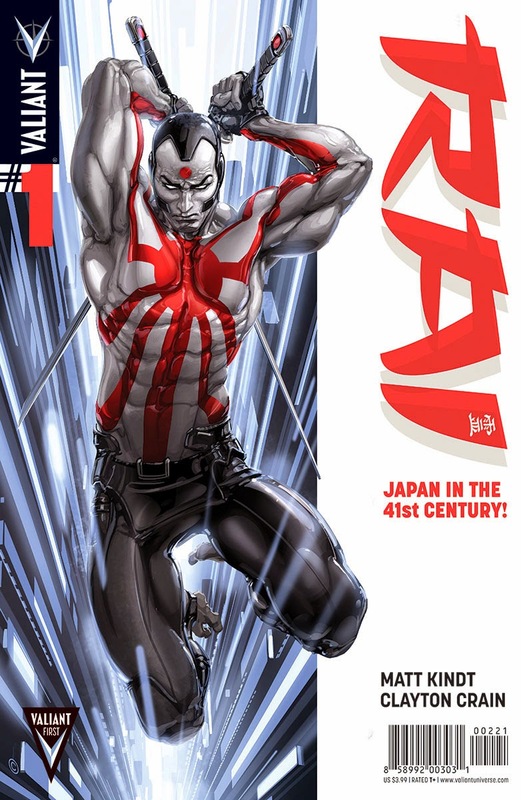 It could stick to basic comic standards and give us the expected adventures of Rai, take-off in bizarre yet exciting directions as seen in the plus edition or straddle the line and incorporate a bit of each. Honestly, I’d like to see Kindt go nuts, draw a more pages himself and capitalize on potential and creative energy of the insert. What say you, Elkin? Elkin: I say that I, too, would like to see Matt Kindt throw every bit of caution to the wind and take this idea places we've never seen before. Let's explore “the seams, the cracks” of this utopian Japan. Let's see the underbelly that manifests the type of control necessary to create the type of society in which there hasn't been a murder in a thousand years. Wouldn't it be fantastic if something unpredictable occurred in what seems to be a foot-dragging rehash of ideas mined by spelunkers who cared not for the traces they left? Kindt certainly has the talent to find new spaces to explore in the caves of our consciousness, so I have faith and will stick-to for a few more. But things better get weird quickly – I'm a restless man (especially after my run-in with Milligan's Shadowman). The last time I read a Rai book, though, things got a little weird, but maybe not in the way I'm talking about here . I also echo your sentiments about Clayton Crain's art --- it's detailed and interesting, but that may be its downfall as well. I don't think I've ever complained about an artist doing too much with a panel before, but there were times when Crain seems to be trying too hard to be interesting with his art. Like you, Wunderlich, I could see this getting very muddied if schedules start to tighten. Right now, I'm not so keyed into what's going on here, but on the strength of my faith in Matt Kindt alone, I'll tie off and follow the series for at least one more issue. If the walls narrow and the stench of guano rises, though, I'm turning back. Especially if there ends up being a Rai-cycle.